SKU: LOGES-1GAL. Categories: Exterior Finishes, Perma-Chink. Tag: Log End Seal. 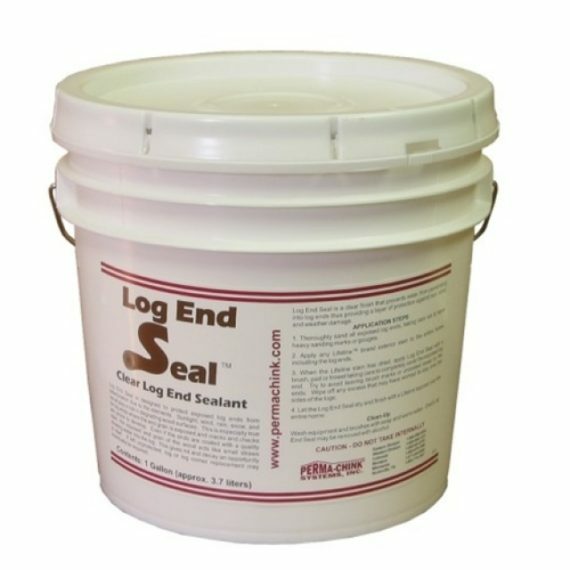 WHAT IS LOG END SEAL™? Log End Seal protects exposed log ends from deterioration due to the elements. sunlight, wind, rain, snow and ice all play a role in degrading wood surfaces. This is especially true for log ends where the end grain is exposed and cracks and checks are prone to develop. Even if the ends are coated with a quality stain, the exposed grain of the wood acts like small straws drawing water into the log. This gives rot and decay an opportunity to start. If left unprotected, log or log corner replacement may eventually be required. WHAT ARE THE FEATURES OF LOG END SEAL™? It resists water and yellowing, adds a soft sheen, and provides UV protection. HOW MUCH LOG END SEAL™ DO I NEED FOR MY PROJECT? When applied correctly, Log End Seal™ will cover 30-40 sq. ft. per gallon depending on the porosity and condition of the wood. For example, 180 / six inch diameter log ends or 100 / eight inch diameter log ends may be treated with just one gallon. HOW DO I PREPARE MY LOGS BEFORE APPLYING LOG END SEAL? As with all staining projects, make sure that your log end surface is clean and free of debris, dust, and dirt. HOW DO I APPLY LOG END SEAL? Apply in dry conditions with temperatures between 40° F- 90° F.
Grind and/or sand log ends smooth and then apply Lifeline Ultra 2 finish. When Lifeline Ultra 2 finish is dry, apply ONE THIN coat of Log End Seal by sponge, paint pad, brush or wide blade trowel completely covering the exposed log end. Wipe off any extra that may have spread onto sides of the logs. After Log End Seal has dried in 2-4 hours, apply one application of Lifeline Advance Gloss or Satin Topcoat. HOW DO YOU CLEAN UP LOG END SEAL? Wash equipment and brushes, etc. with soap and warm water. HOW SHOULD I STORE LOG END SEAL™? Store Log End Seal in a cool dry area away from high temperatures. DO NOT ALLOW TO FREEZE! Shelf life is 1 year if stored properly. How is log end seal packaged and shipped? Log End Seal is packaged in one gallon containers and is shipped via UPS ground. HOW DO I ORDER LOG END SEAL™? Log End Seal is nationally distributed by LogFinish.com. To order Log End Seal use our secure online order system 24/7 at www.logfinish.com or contact us by phone at 888-208-2248, fax or e-mail. Our offices are open Monday-Thursday from 9:00 AM to 7:00 PM and Friday from 9:00AM to 5:00 PM Eastern Time. Be the first to review “Log End Seal” Click here to cancel reply.